The Luk Tung Kuen website, launched since 2005, has been very successful in accomplishing what we set out to do...that is to reach all corners of the world and benefit the seniors and people who are interested in a low impact but effective exercise. The following persons have contributed greatly to the website hence we are now acknowledging their efforts. JOHN CHAN - photographic artist of San Mateo for his visual artwork. He created the Luk Tung Kuen logo (resembling a person in form of letter 6 in Chinese)which is registered at the United States Library of Congress Copyright Office. John is 97 and exercises everyday with us. RUDY WONG - church administrator of Community Baptist Church in San Mateo. Rudy spent countless hours and applied his skills to the design and construction of the website. He also started a class at a mission camp in the city of Belmopan, Belize. JOANNA ZHAO - Vice President of California Five Branches University which is a teaching university that specializes in Traditional Chinese Medicine. They have campuses in Santa Cruz and San Jose. Joanna did the calligraphy of the 3 Chinese characters for Luk Tung Kuen. She descends from a long famous lineage of Chinese calligraphers, and her art is displayed in the Museum of Art and History in Santa Cruz, California. JUSTIN LI - from Hong Kong. Justin recently graduated from Carnegie Mellon University in Computer Science and now recruited to help with the posting and updating of the webpages. He is working for Tiny Prints in their Computer Engineering department. 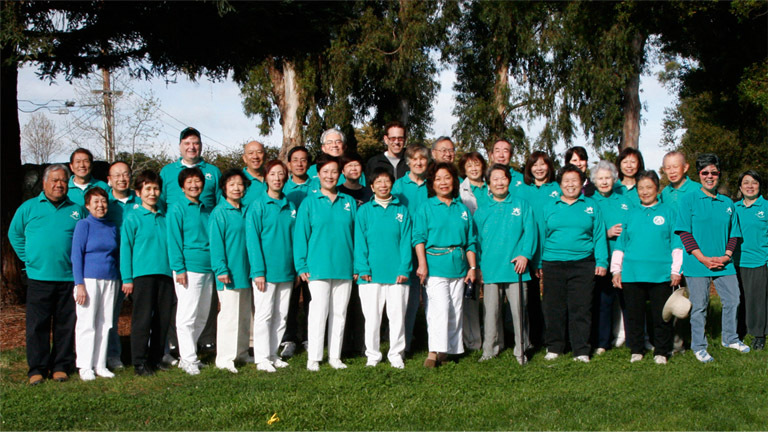 PHIL CHAN - a resident of Millbrae, California. Phil is a professional video-photographer and helps to record many hours of activities for LTK group. He has filmed Mater Ha Kinh on her visits to USA. Phil volunteers at San Francisco International Airport and Self Help for the Elderly. EVELYN TING - graduate of UC Berkeley and now resides in San Mateo. She initiated the idea of creating a website for Luk Tung Kuen so that this exercise will be preserved for future generations to benefit the public, especially for the seniors. The website serves as a link for the many exercise sites worldwide and provides updated information for people who have immigrated or are traveling to other countries. They can stay connected to Master Ha Kinh who lives in Hong Kong and who is still very actively teaching it. Evelyn also answers all emails and is able to send out instructional materials to those interested. She travels to Hong Kong often to liaison with the Master and her instructors. LTK participants at Beresford Park - for their active participation in contributing to testimonials, videos and photos. And above all, their willingness to share the benefits to their family and friends. We have come together as friends of LTK and this is the same in Hawaii, Singapore, Toronto, Vancouver, UK and Hong Kong.